• Food and drinks – drinking coffee is infamous for causing tooth discoloration, but tea, colas and wines also have the same effect. Some choice fruits and vegetables can also cause tooth stains. Consuming any of these can contribute to discoloration. • Smoking – Due to the presence of nicotine and tar, teeth become yellow, which eventually turn brown after extended exposure to cigarette smoke. • Poor Oral hygiene – bad dental habits such as neglecting to brush or floss can lead to plaque build-up, which results in discoloration later on as well. The truth is, however, even avoiding above named common substances we may still see dulling in our smile over time. Most of the stains that we notice have occurred over several years. It is because of the longevity of stains in the enamel that commercial whitening products are generally ineffective at producing optimal results. To reach stains in the deeper layers of enamel takes a more powerful yet safe product, one that is available at your dentist. Originally, teeth whitening was designed as a professionally prescribed home treatment. Still today, home whitening remains a highly convenient, effective way to remove tough stains from teeth. We begin the process by taking impressions, which will be used to create a well-fitting whitening tray. 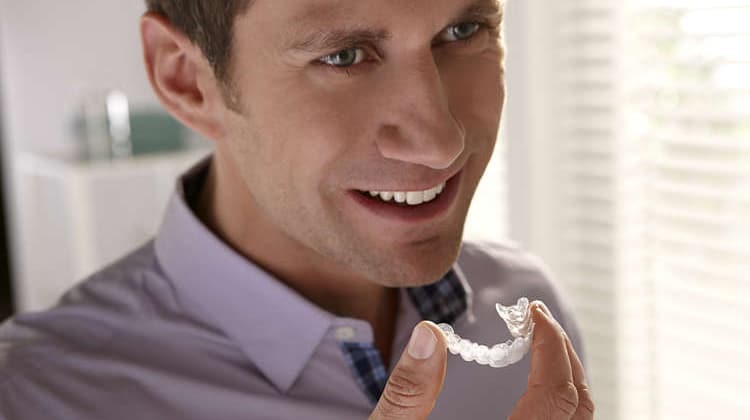 A whitening gel is carefully placed into the trays and then placed over the teeth in both arches. This can be done in the convenience of your own home and in your own time. The added benefit to this, in addition to its convenience, is the ability to control your own desired result and continue to do maintenance treatments for little or no costs. 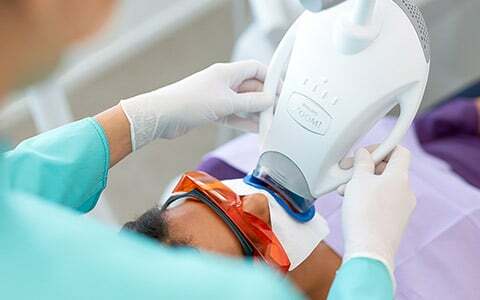 Provided with professional grade whitening solution, our patients may wear their trays for as little as thirty minutes a day, and see their best smile emerge in just a few days. We advise against the in office treatment on its own. As it is not a permanent procedure, the effects eventually fade, causing most to be quite disappointed in the treatment. However, the ideal treatment plan is to receive the in office system to quickly reach your desired result and then use the at home treatment variation to maintain the effect. A brilliant white smile is seen as a sign of health and vitality. At Muswell Hill Smile we offer safe and effective whitening that works for your timing and budget. Contact us today to enhance your smile. Brightening your smile doesn’t have to take any longer than a couple of hours. In a single visit, in-office teeth whitening can significantly improve the brightness of your smile. In-office teeth whitening at Muswell Hill Smile is ideal for those with busy schedules who need to maximize their time, and for people who want to revive their smiles quickly for an upcoming event. An in-office whitening treatment is as effective as home whitening, but without the wait. The treatment involves the use of a light-accelerated bleaching system applied and monitored by the dentist. By using this system the effect is significantly accelerated and before the end of your visit your teeth have reached the level of white that you desire. The process can be repeated for stains that are more resistant or for intense whitening . The benefit to this is the instantly perceivable results. Some people use the in-office whitening treatment as a jump-start to their home-whitening regimen.